A few days ago, I was trying to convince the freshmen and sophomores in my Western-Civilization survey to sign up for my upper-level class in the fall. The upper-level class will cover the history of Late Antiquity, roughly the years 250 to 750. We’ll talk about the fall of Rome, the rise of the church, and the formation of the medieval kingdoms of Europe. It’s going to be awesome. 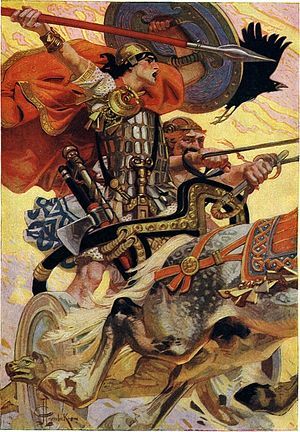 In order to pique their interest, I told the class that we would be reading the Táin Bó Cúailnge. The book recounts an epic cattle raid in Ireland. That’s right, a cattle raid. I like to think of the Táin as the Iliad of the north. The queen of Connacht steals the Brown Bull of Cooley (he’s an exceptionally fine bull), and the men of Ulster have to get him back. It’s epic; it’s heroic, it’s awesome. My student’s question about cattle raiding is really a much bigger question, and she’s not the only one asking it. All of America is asking, “What do we need the Liberal Arts for?” Many academics, attempting to justify their professorships in the humanities, have proposed various answers to that question. They’ll tell you that a Liberal Arts education promotes critical thinking and problem solving. They’ll tell you that the humanities give you a proficiency in written communication that will enable success in the business world. I believe these things, but on that day, I felt something different. My student was right. She didn’t need a cattle raid, and she didn’t need the Liberal Arts tradition. But what does that matter? When you get down to it, what do we as humans NEED? We NEED food, shelter, and clothing. Those things are necessary, but they aren’t particularly exciting. Most of the things that bring us joy in life aren’t actually necessary. What’s your passion? What’s your hobby? Strictly speaking, you probably don’t NEED it. Similarly, a math major doesn’t NEED to read about the greatest cattle raid in history. But wouldn’t it be great if she did. We Americans tend to be too utilitarian. We’re a pragmatic people. Sometimes this pragmatism causes us to lose sight of what it means to be human. Temperance, prudence, courage, justice, faith, hope, and love: do we need any of those things? Do we need to be curious about this crazy beautiful world we live in? No, we don’t NEED any of those things in order to meet our basic necessities. We probably do not even need those things to be successful in a particular career. Let me suggest that we Americans tend to ask the wrong questions. “Why do I need the Liberal Arts?” You don’t, but you shouldn’t be asking that in the first place. And that’s really the best thing about the Liberal Arts. An education in the humanities helps us get our eyes off the wrong questions, and it forces us to start asking the right questions. Being human isn’t about meeting our needs. It’s so much more. A nice upbeat post about your passion. Nicely done. I hate to play devil’s advocate when I so heartily agree with you, but I fear that a lot of people like your math major will say why should I pay many thousands of dollars to read something just for the fun of it? Can’t I do that on my own? I have two responses (not really answers) to your question. First, you could learn math on your own too, using books and the internet. It’d just be a lot harder. It’s easier to pursue the humanities with a teacher in the context of community. Second, the Liberal Arts education exposes you to all these new texts and ideas. There are some awesome things in this world that you probably wouldn’t know about without a Liberal Arts course of study. I can’t even imagine the red tape. On a more serious note, thanks for this blog, it is useless to always ask what we need to make life worth living, art does play a serious part in giving meaning and value to life. Wow, that seriously pulled a 180 on my thinking, and it’s absolutely right. We definitely need to rethink how we view the liberal arts, and how to delve into the ways to further ask the questions we need to. Really good piece of writing! Your students are so lucky to have such an awesome teacher. They should sign up for anything you teach. We should have more teachers like you! Thank you! Sounds like a class I could enjoy! Liberal arts provide context and depth, vision and perspective, meaning and heft. Without the experiences the arts provide everything fades to gray for me. I’ve believed for a long time that the purpose of higher education is to teach a student how to think, not about a specific topic at the end of four or six years, but about the world, life, people, themselves. Now I’m thinking, “what questions should we be asking?” Thanks for the brain food! Great post! I’ll have to show it to all my friends who are convinced I’m wasting my time in the liberal arts. If I could, I’d give you a standing ovation right now. It could be indicative of my personality and my interests, but some of my best classes in college were the ones that were humanities/liberal arts. They included a small political thought class (with a history emphasis), a pop culture history class, and a nonfiction creative writing class. I can’t imagine living life without wanting to learn more about lots and lots of things. Sure, I don’t necessarily have a huge interest in math/traditional science, but I like learning about scientific things as well as psychology, sociology, etc. It’s all so fascinating. Do I NEED it? No. As a history teacher (though only for a few more months) I totally agree with you. I’ve heard a few students ask me why history matters, and I pretty much tell them the same thing you told your student in class. Because history is amazing and sometimes even puts the best fiction to shame for sheer madness, heroism and stupidity. Thanks for helping keep history in the present! Your topic question here could well be ‘what’s the purpose and meaning of life?’ I’d suggest your math major is more likely to find satisfactory answers to this question in a liberal arts class than elsewhere. By all means do math……but why are you doing it? What does it all mean? The Tain was perhaps my favorite book/story I read in college. There is a lot to learn from this over-looked, epic cattle raid. Cuchulain is a hero for the ages. So true. Thanks for the vote of confidence. Your student DOES need that. Well, maybe not the cattle raid, specifically, but history and writing and literature, definitely. Classes like yours in history, writing, literature, art, music, etc. aid in the creation of new ideas that provide the “what” to go with the “how.” Without new applications that come from exposure to these “frivolous” subjects, our more technical capabilities become much less viable. To some degree, we really must have both. Otherwise, we can end up with a well stocked, state of the art tool kit and no idea what to build with it. I remember learning about The Tain in primary school. It is still one of my favourite stories. We need the Liberal art as we are not machines, without the metaphysical we become less human. I would love to join your class 🙂 !! It would be a lot more interesting than Math (though I love that too 😛 ).. A Good One. Really interesting article, have reblogged it. The raid sounds fascinating too- I want to know if the men of Ulster prevail! You’ll just have to read it! I do agree with you, but then pragmatism has to kick in somehow. I don’t deny that liberal arts is wonderful. I loved liberal arts, majored in one, and yes while it opened my eyes to some things, I still didn’t think it was worth a college education and thousand of dollars over. In the end, when it comes to the real world,your liberal arts education is overlooked and becomes essentially worthless because employers do not see its value the same way. This isn’t a matter of materialism anymore but one of survival. One can only allow oneself to indulge in the “frivolities” and character-building part of the liberal arts only if one doesn’t have to worry about financial situations and paying off debts. I feel there’s such a great disconnect these days between a college education and the real world that I’m losing hope in education. I wish those two were more connected somehow. A college degree these days is just a matter of whether one can afford it or not. It doesn’t really count for anything for. I have friends who are far more open minded and intellectual without every obtaining a degree simply because they could never afford one. You’re right; the debt associated with higher education should be a real concern. I think it’s a bit of a red herring when critiquing the humanities. Students should never take on more debt than they can afford, no matter what their major. The dirty secret is that those STEM jobs don’t pay enough to justify high levels of debt either. I’m an undergraduate pursuing a degree in Liberal studies at school of primary sources. Could you — and many other professors in Humanities — stop using this conventional pretension that we “don’t need the Liberal arts” as if the liberal arts were something to enjoy or go through like a wandering sensualist? The maths ARE liberal arts. Sam, thanks for your comment. Believe me, I’m no sensualist, but I do encourage curiosity. When I talk about the Liberal Arts, I’m not excluding mathematics. But oftentimes students and professors voluntarily exclude math from the L.A. by the manner in which they pursue it. If curiosity and creativity drive your study of math, then great! But if your math is merely a soulless crunching of numbers, then you’re not part of the L.A. tradition. And I suppose that if your English course of study turns into a soulless crunching of texts, then you’re not part of L.A. either. Seems like there might be another blog post in that somewhere. I’m not sure so sure about that. The Greeks did study geometry and the stars to align the soul to the patterns of the stars. Dominating and understanding the human condition have been part of a long tradition of the Western conversation. The soulless math crunchers are apart of that. I believe — in the same way — a math student is also pursing an L.A. education. Being on a tech campus while studying the presocratics brings to light how well-rounded these math crunchers are. After studying the primary sources on chemistry, I’ve come to accept a more technical education as an equally excellent education. I think the difference between the “soulless” math cruncher and I is that I can ask more critical questions concerning a wide variety of topics — while the math cruncher would find the best method to answer these questions for a large array of topics. We DO need love, self-knowledge, prudence, courage, temperance, cooperation, altruism, care, charity, mutual respect, and sheer stubbornness in order to survive. We need broadness of mind amd the ability to recognise and empathise with others. These are essential survival skills – Darwin didn’t just write about competition but about altruism and cooperation – and you would be justified in saying that the liberal arts, from literature to making of music to appreciating visual art, are just that: survival skills. I have to say it… boy am I glad that I live in Europe… We love cattle raids! Cattle raiding is in our blood, we laugh at sheep raiders, and sniff at thieves that prefer poultry! And mathematics – pah! Try reading Joyce, it’s harder than understanding the most complicated dark matter theory. It’s what we do best, cattle raiding and writing (apologies in advance Mr I Newton, Mr C Darwin and all other eminent theorists… Just remember your ancestors were once cattle raiders too). Absolutely loved this! I just graduated from a small liberal arts college with a degree in English, and I can’t imagine having gone anywhere else. A liberal arts education has truly made me into a humanist and helped me find so much in the world to interest me. An Irish poem on cattle raiding sounds like an absolute blast to me, cheers on being freshly pressed! Pathways to a good career: internships, job experience, inventing something or founding a company, networking. Pathways to good life experience (which can be used to enhance the above): travel, meeting new people, constantly learning new skills. All of these things we can do on our own, so what is the point of a liberal arts education? The point is creating an atmosphere in the mind where learning is a reward in itself. It creates people who can enjoy the silence and create something out of it, so to speak. With a foundation built upon this, all of those other things come second nature.Too bad college is so overpriced now. I wish I would’ve spent my $20,000 (and I am on the way low end of the spectrum) on gaining some real world experience supplemented by library late fines. Then again, perhaps it was my professors who steered me onto the right path. It’s a catch-22 as it is now. Do you know what was the most exciting and passionate moments I’ve come across during high school (grade 10,11 & 12) while attending classes, it was when our history teacher would take us on an adventure through history and make us live the moment as it was. It would be as intriguing as watching a historical documentary/movie, it would be the only class where students (80% of them were totally not into school and studying) would bring their chairs close to the teacher with excitement and listen to what the teacher has to say eagerly, tirelessly and passionatly. History had the most memorising to do for its Final Exam preperation, but surprisingly it was the subject which I received the highest mark in. I read the Tain in a combined Irish literature and history course in college. I had a stack of reading material literally three feet high to complete prior to the exam in one semester. It challenged my time-management skills, but not my interest. It was fascinating, heart-breaking and liberating. I changed my point of view of what it meant to be Irish. It’s not about green beer and leprechauns, it’s about pride, story-telling, charm and perseverance. Only history can show us who we are and who we can be. I’ve raised my children to be proud of being Irish, and I doubt I would be as proud without that oppressive stack of literature and history in my past. Keep up the good work, maybe everyone doesn’t appreciate you, but I’m sure there are plenty who do. May we all continue to live under an oppressive stack of literature. “Will this be on the test?” Six words that kill the soul. An excellent piece; and very well said! I frequently remind people of George Santayana’s words: “Those who cannot remember the past are condemned to repeat it.” Math majors, computer science majors, pre-med students and liberal arts students alike are all going to be members of a society at large. How they relate to and interact with others in that society and, in fact, the decisions the broader society itself makes are all impacted by critical thinking (or lack thereof) and our understanding and perspective of (or lack thereof) the past. I particularly find utilitarian pragmatism in education shortsighted, and dumb, not to say philistine, wrongheaded, and lacking in understanding of the World at large, denying the values of past generations left us for us to acquire wisdom. Really liked this one. It’s easy to feel the compassion you have about the things you do. And I totally agree on the divergence between things that are obligatory, and those that appear to be optional. However, those are the the things everything comes down to. It’s like details in a painting. In the end of the day they really define what you see on the canvas.